This bathroom is teeny tiny, and we couldn't change the original footprint. But using quality materials and light finishes made it feel new and bright, and perfectly suited to the elegance of the house. 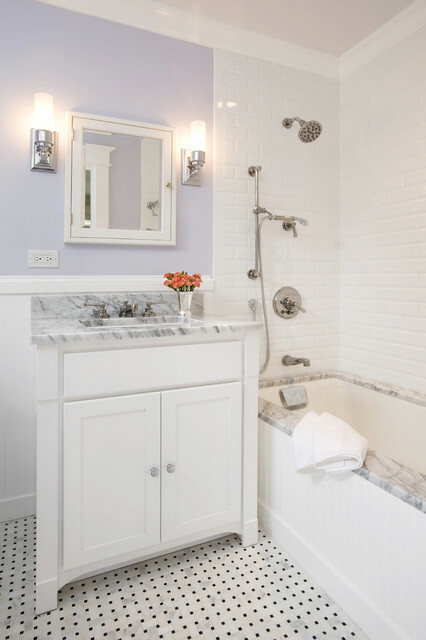 Beveled white tile, lots of Carrara marble, polished nickel fixtures, and period sconces all played a role in this spectacular facelift. marble around drop in tub matching vanity top. If can't have a claw foot due to space, this is a nice look. For drew bathroom - need to keep a tub - prefer deep.